How does Resistance 3 fare both with and without the PlayStation Move motion controller? 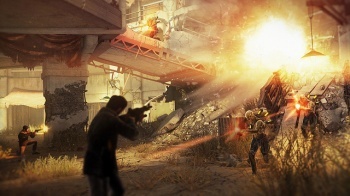 Resistance 3 is one of Sony's most heralded exclusives, so the company obviously brought the game to E3 this year. It just also happened to bring a bunch of PlayStation Move controllers with which to control the game, and announced a Resistance 3 Move bundle featuring the Move rifle attachment and all associated Move accessories. The big question is, how does the game work with Move? First, I feel the need to talk about how Resistance 3 plays without Move. Using a standard Dual Shock controller, Resistance 3 plays great. The level Sony allowed us to play was a small fenced-off yard with a couple of buildings, one of them multi-level, and a bunch of obstacles with cover such as abandoned cars. It was basically an arena fight with Chimera pouring in from all ends and the player having to defend his position and squad. Air transports dropped Chimera off on rooftops, and also climbed in over fences. They weren't overly tough, but they were relentless. I could use two different weapons in the demo, an assault rifle type and a powerful magnum type, in addition to grenades and melee. Taking down Chimera made them explode with blood, especially after nailing a headshot with the magnum. Meleeing up close isn't recommended, as the Chimera are pretty damn ugly, but it works. The level felt a lot like what we've seen from Resistance in the past, with constant streams of enemies and you wondering how much longer you'll have to survive against them. Which is all well and good, until Move got involved. I admit I didn't spend much time with the Move rifle attachment, but to be completely honest I didn't enjoy it. You have to hold the gun with the stock up to your shoulder and it felt uncomfortable for me. I like to hold gun peripherals in varying positions for games that support them. In addition, navigating the game world with Move just seemed pointless. Aiming side-to-side by moving the reticule to the edges of the screen was inaccurate. Trying to get to cover and aim at enemies was a chore. The only good part was that all of the buttons for reloading and swapping weapons were handily within reach on the rifle. After using a Dual Shock to play Resistance 3, I don't see why you'd try Move. Again, I had a short experience with the peripheral. Maybe your experience will be different, but that was mine. I basically got the impression that people who enjoyed the earlier Resistance titles will want to look into this one too. It'll be good for more Chimera-shootin' action. Just think twice about that Move bundle.